Whenever my friend Andrea schedules a return visit to his native Sardinia, I try to remember to ask him to bring back a bottle of Mirto for me and to give him some cash to cover the cost. It’s one of my favorite after-dinner drinks and since it’s difficult to find in the U.S. his courtesies in this regard are always appreciated. Mirto is a liqueur unique to the islands of Sardinia and Corsica. It is made from the berries of the flowering Mirto (or Myrtle) plant, a distinctive plant that grows throughout the Mediterranean basin but is most prolific on the islands of Sardinia and Corsica. The berries are dark blue in color and look somewhat like blueberries but bear no relationship to blueberries in taste or otherwise. Myrtle berries have long been recognized, dating back to the time of the ancient Greeks, for their restorative and medicinal properties. The liqueur is made from the berries of the plant. It produces a liqueur that has a reddish-brown color with some violet tints at the edge. It opens with an amazing bouquet of sweet herbs, dried fruit and kitchen-spice aromas. The initial taste is met with a bittersweet burst of cinnamon, clove and dried orange peel flavors overlaid with an intriguing and subtle taste of maple syrup. It has an only slightly bitter almond finish that keeps hanging on. Mirto traditionally is served at the end of the meal as a digestivo (a digestive aid) and is always served well chilled. Every restaurant on Sardinia regardless of size, location or status will ask guests if they want a glass of Mirto after their meals. While Sardinians would probably scoff at this, I enjoy adding a splash of Mirto to vanilla gelato or ice cream for a really refreshing and flavorful dessert. 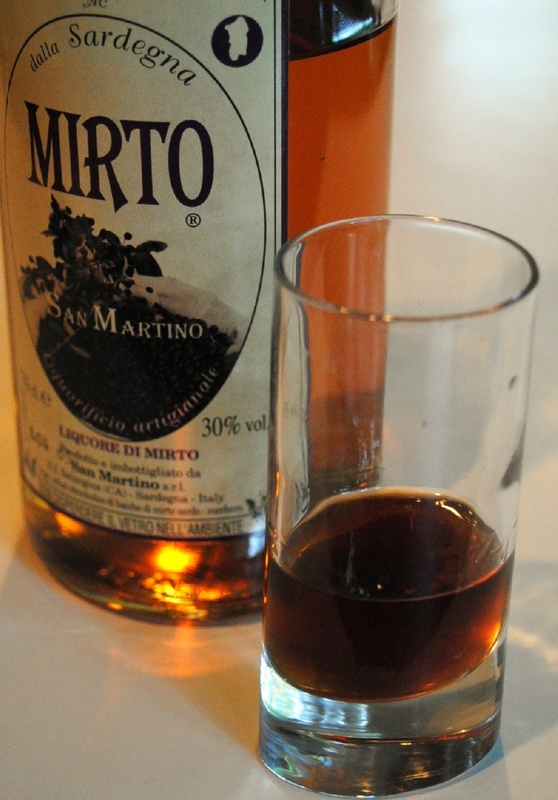 Like most other fruit liqueurs, Mirto is not that difficult to produce. It is made by infusing a base alcoholic spirit, usually vodka or grain alcohol, with fresh Myrtle berries. The base spirit absorbs the aromas, flavors and color of the fruit. After steeping for a certain period, typically from five to six weeks, the mixture undergoes a soft press and the berries are drained off. The remaining flavored, alcoholic liquid is sweetened by the addition of sugar and/or honey. Since the mixture is high in alcohol, approximately 50 - 60 percent alcohol by volume, filtered water is added to cut the alcohol to no less than 30 percent. The sweetened mixture is then put away to rest for another 30 or so days after which it is filtered to remove any remaining solid residue and to clarify the color. It is then bottled and made available for sale. The process is essentially the same as for any fruit liqueur such as limoncello, Cointreau, Grand Marnier and, yes, Slivovitz. If you have ever made limoncello you can also make Mirto. The only problem is finding a source of fresh Myrtle berries. It is a seasonal fruit and I’m not aware of any place that sells fresh Myrtle berries. Even the liqueur is difficult to find in the U.S. Unlike Sardinia where Mirto is ubiquitous, there are few establishments in the U.S. that carry Mirto so it is problematic to find a restaurant that serves it by the glass. It is just as difficult to find a retail wine or liquor store that sells it by the bottle. I’m told that Eataly in New York City sells some but I have been unable to confirm that. Some Total Wine stores sell a product labeled "Mirto" but it really is a Tempranillo wine and not a Mirto liqueur. I'm only aware of one store that carries Mirto and that's in the Washington, D.C. area. It sells a 750 ml bottle of Argiolas Tremontis Mirto for $33. So with this one exception I’m essentially dependent on my friend Andrea to schlep back a bottle of Mirto for me whenever he can on his return trips from Sardinia. However, that’s what friends are for and he’s only too happy to stop by from time to time to chat over a glass of Mirto.